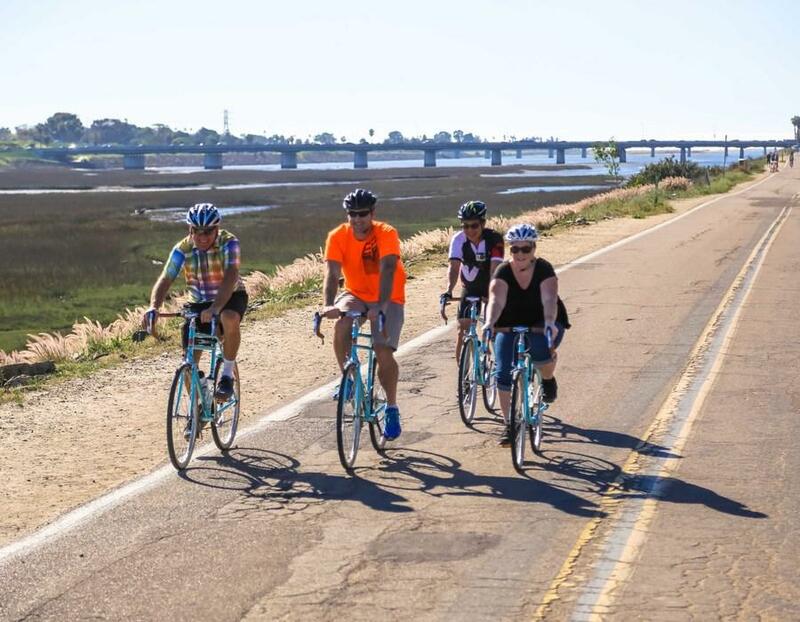 We ride around the exterior road of Fiesta Island before leaving the Island to ride around it a second time on the surrounding paths, trails, and bridges of Mission Bay. On our second encirclement of the Island we'll check out Pacific Beach, visit Vacation Island, and ride along the San Diego River past Sea World before finishing back at Fiesta Island. This the only way to really see a city, I can't believe you have a bike to fit anyone....makes it so easy. 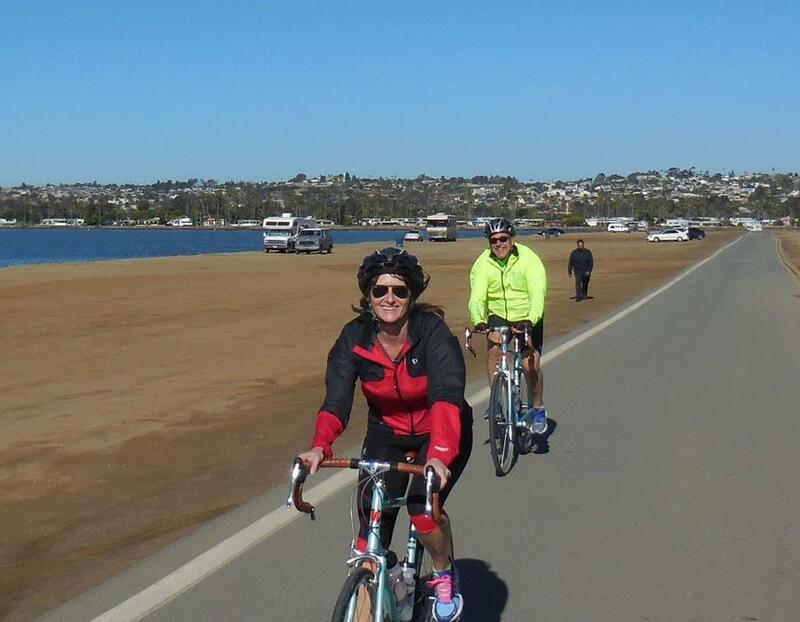 Getting great exercise & enjoying so much of the beauty of San Diego is a perfect combo. 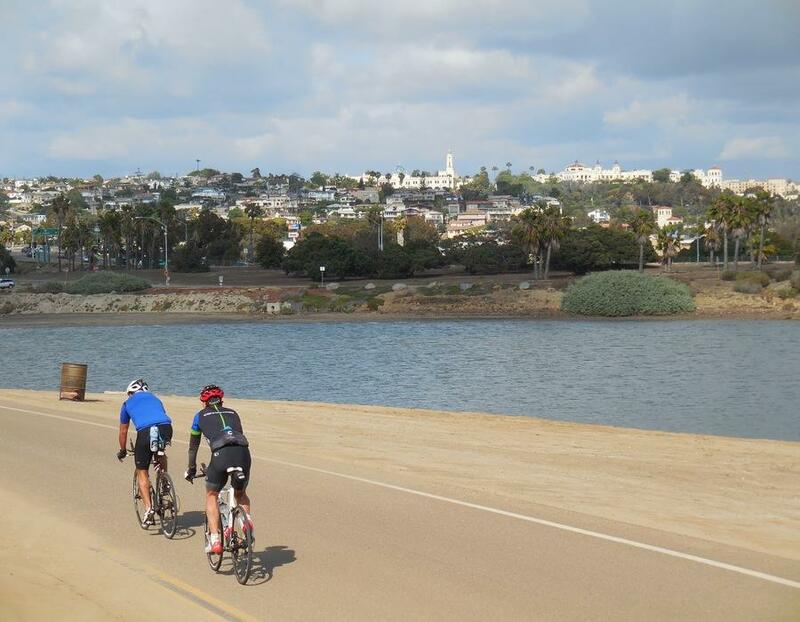 Fiesta Island is San Diego's premier cycling location and this route highlights the best of the best. Fiesta Island is has a single extra-wide traffic lane around its perimeter where all the traffic moves in the same direction. It truly is the hub for outdoor activities in Mission Bay. 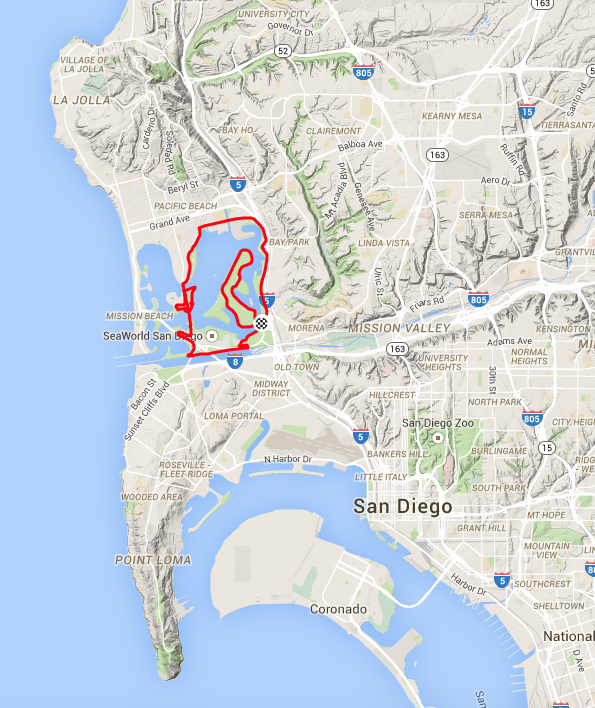 We start by going once around Fiesta Island for a 360 degree view of Mission Bay. That done, we'll leave the Island to begin a larger circumnavigation of the Island via Mission Bay. This counter clockwise trek starts by passing Tecolote Creek and De Anza Cove with a view of Mount Soledad's cross in the distance. We cross Rose Creek Bridge we reach Crown Point in Pacific Beach, host to the annual Susan G. Komen 3-Day walk. Next up is the Mission Bay Bridge over Fisherman's Channel and a full length view of Mission Bay with the Pacific Ocean as a backdrop. Over the bridge on Vacation Island we'll glimpse the Balboa Park and the California Tower in the distance with a panorama of Mission Bay in the foreground. We cross the Ingraham Street Bridge to the San Diego River and its host of wildlife. Bringing it full circle we pass by Sea World San Diego and south Mission Bay where jet skis reign supreme and back to Fiesta Island and the end of this compact tour. Taken at a leisurely pace this is an easy, scenic tour. It's accessible to the novice rider because it has; virtually no climbing, no technical turns or descents, smooth roads and bike path surfaces and it typically has light traffic. It's the perfect ride for someone who wants a safe riding environment for improving their bike handling skills or to increase their comfort when riding on streets with auto traffic. 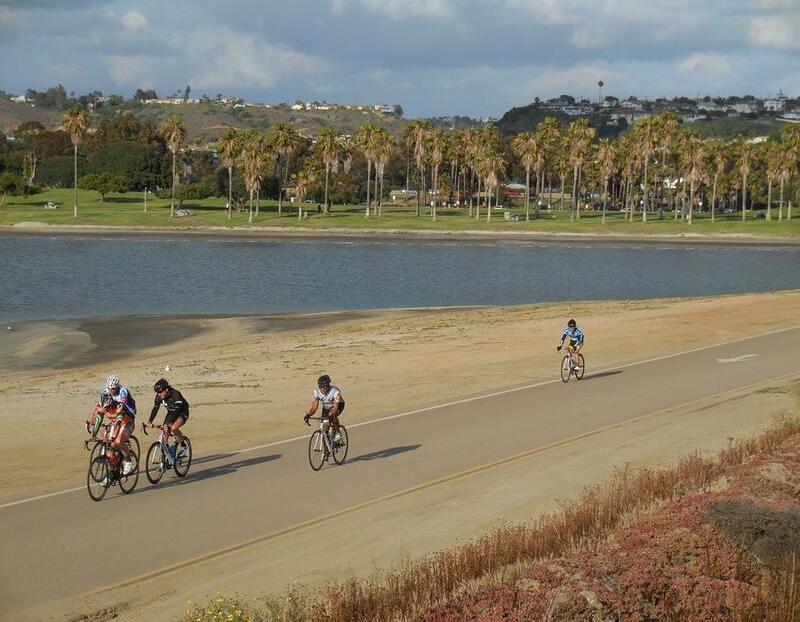 Don't be surprised to see cycling groups, runners, roller bladers and the likes on Fiesta Island. It's their playground too. 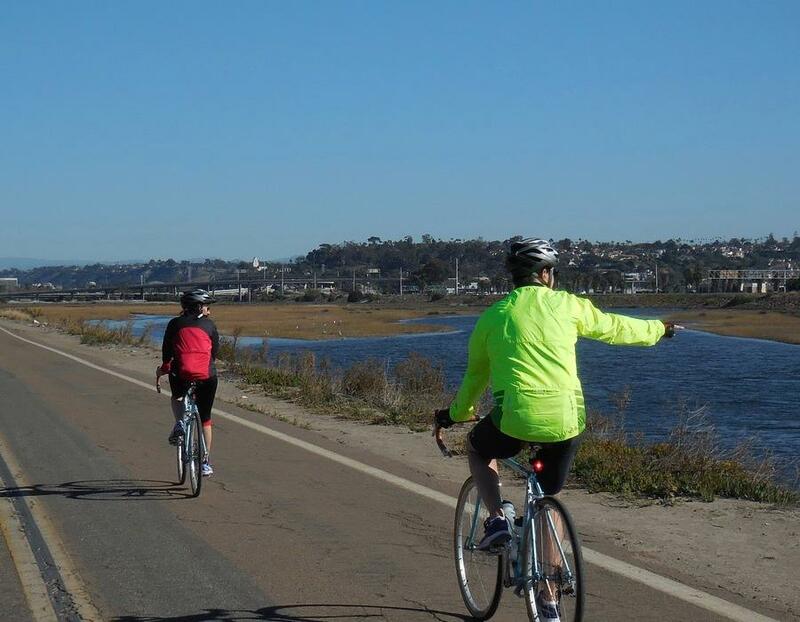 This is a short ride that rolls easily through a great outdoor enviornment around Mission Bay through Pacific Beach, Vacation Island, and along the San Diego River. Start times for this route are very flexible with morning and afternoon both working well. However, strong winds in the late afternoon can create blowing sand on Fiesta Island and in this case a late afternoon start should be avoided.